"Eileen Lowry is a keyboard enthusiast of the highest calibre. Although not a professional player herself many accomplished players have benefitted as a result of her wealth of knowledge and understanding of these keyboards. It is probably her empathy with the home musician that makes her tutorials so informative and enjoyable for all those who play Yamaha keyboards as a hobby." 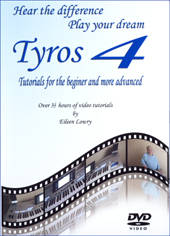 As I am new to Tyros having changed from KN7000 to T4 a few weeks ago I would highly recommend this DVD to anyone new to Tyros or for T4 owners. This is one amazing lady whose knowledge of T4 is quite amazing. This enables you to get to know all aspects of T4 without having to work though the manuals. Was a bit confused with audio recorder and sub track but mastered it almost immediately after viewing DVD.